▶ SoldThis listing was sold on Nov 30, 2018 for the price shown here. VA LOAN APPROVED!! NEW PRICE! Motivated Seller! 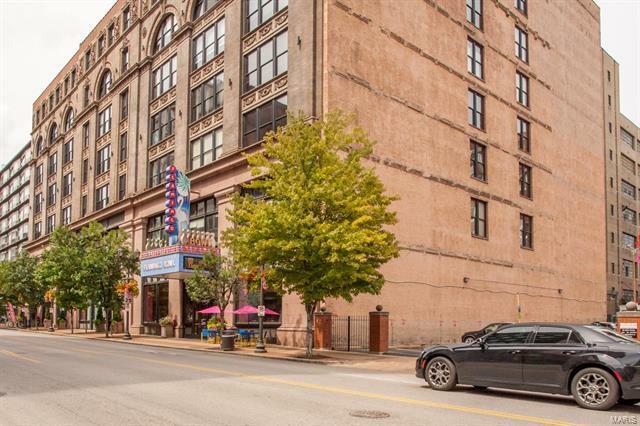 !SECURE INDOOR PARKING***IN UNIT WASHER AND DRYER***FREE WIFI INCLUDED IN CONDO FEE, FREE CABLE INCLUDED IN CONDO FEE***OVERLOOKING WASHINGTON AVE***ROOF TOP POOL AND DECK AREA One of the largest 1 bedroom 1 bath lofts in the building. This loft faces Washington Ave with nearly floor to ceiling windows. Wood timber beams stretch across the ceiling while polished concrete floors shine throughout the condo. A very spacious bedroom with attached full bath and walk-in closet makes great private space. There is a hallway entrance to the bathroom and to the in-unit washer and dryer making it convenient for guests NOT having to walk through your bedroom. GRANITE COUNTERS***WASHER/ DRYER/ REFRIGERATOR INCLUDED!! Plenty of room for comfortable sofa, chairs and flatscreen! One premier parking space and a storage unit are included with property sale. Hwy 40/64 to 11th street exit. Head North on 11th street to Washington Ave. Cross Washington Ave on 11th, make left onto Lucas Ave. Park in the back of building on Lucas Ave.